Daniel Manville said he has had just about enough. As the director of the Civil Rights Clinic at Michigan State University, he has to travel from the Metro area to Western Michigan to the far west side of the Upper Peninsula in order to meet with clients. But when he started hearing that prisons were going to shorten the hours during which attorneys could meet with clients, and that some were not going to provide private meeting space for confidential conversations, Manville said that burden was too much. He said he first had a problem when he was visiting a prison in Adrian. He was told then that he couldn’t use a private conference room to meet with his client. “The woman working the desk said, ‘We don’t have a key for that room,’ but that’s just ludicrous,” Manville said. The captain produced a key, but when he couldn’t track down an officer to provide personal protection for Manville, the meeting had to take place with the door open. Manville didn’t make much of it, and wrote off the experience as a fluke. But then he visited another prison, where he was told that there would no longer be visiting hours on Tuesdays and Wednesdays, even for attorneys. So he’s suing the director of the Michigan Department of Corrections, and wardens at three prisons. He filed Monday in the Eastern District. Manville said that he was told that budget cutbacks have caused the prisons to shorten visiting hours. Among the other named plaintiffs are attorneys Gerald Lorence, Craig Davis, Dory Baron, Lee Somerville and Nick Suciu. The case is Civil Rights Clinic, et al. v. Washington, et al. If you’re a fan of just about anything, you can sign up for text message updates (also known as mobile alerts) from that thing. Sports teams often use them to send ticket deals and score updates to fans. Of course, these things are “opt-in,” so if you don’t want them, don’t sign up for them. Fred Weiss signed up for mobile alerts from his beloved Pittsburgh Penguins. When he signed up, the team’s documentation said he’d received “no more than three texts per week.” In the first week, he received five text messages. The second week, four. That’s right, he received three extra text messages over a two week period. This was unacceptable. If there’s one man in the world that you don’t send three extra text messages to, it’s Fred Weiss. Fred Weiss isn’t going to stand around and let some automated service send messages that, assuming he doesn’t have an unlimited texting plan, cost him an extra 30 cents. By exceeding the authorized limits on weekly text message calls made to Plaintiff… Defendant has caused Plaintiff and the other members of the Class actual harm, not only because they were subjected to the aggravation that necessarily accompanies the invasion of privacy caused by unsolicited text message calls, but also because consumers frequently have to pay their cell phone service providers for the receipt of such wireless calls. I did mention this was an “opt in” thing, right? 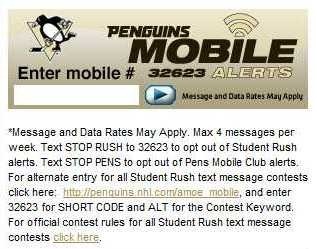 Weiss could simply opt out by texting STOP PENS to 32623. How do I know this? I went to the website. This took 20 seconds. Instead, he filed a lawsuit. Not just any lawsuit, but the Lawsuit of the Month. Southfield rehabilitation and nursing company Health Partners, Inc. has agreed to pay $25,000 to settle a case in which the company was accused of discrimination against an employee who had tested positive for tuberculosis. In EEOC v. Health Partners, Inc. (Case No. 2:11-CV-12024), filed in U.S. District Court for the Eastern District of Michigan, the EEOC charged that Health Partners violated the Americans with Disabilities Act (ADA) by refusing to allow an employee to start working after she tested positive for tuberculosis on a preliminary skin test. The EEOC contended that such conduct violates the ADA because Health Partners regarded her as disabled even though she was not contagious and did not pose a direct threat of health risk. Rather than engage in protracted litigation, Health Partners agreed to a two-year consent decree which requires it to pay $25,000 to the employee and train those employees responsible for hiring about ADA rules, according to the EEOC. Today the House Judiciary Committee will take up a package of bills that would allow district court magistrates and judges, and probate judges to solemnize marriages anywhere in the state. Senate bills 698-700 have passed in the Senate. They would allow judges to perform marriages anywhere in the state without having to get a temporary assignment from the State Court Administrative Office; it would also require a $10 fee for performing the ceremony to be paid to the court. Just in time for wedding season, the committee will discuss the bills this morning at 10:30. When clients come to Miller, Johnson, Snell & Cummiskey PLC’s new Kalamazoo office, they might be tempted to ask if they get to use the pool, too. That’s because come June 22, the firm will take up 18,000 square feet on the second floor of the business suites of the Radisson Plaza Hotel & Suites. The firm’s Kalamazoo outpost had spent 32 years in the downtown district on Rose Street, two blocks away from its new location. There are 14 attorneys working there. Lance Hartman, the firm’s director of marketing and business development, said the move wasn’t being made because of immediate expansion, but more so out of updating and increasing space for potential future growth. Judge Kirsten Nielsen Hartig has had quite enough of the K2-related crimes in her county. Hartig, a judge at 52-4 Oakland County District Court, decided to go undercover to search for retailers who are selling K2, or Spice, or any of the other many substances that are passing themselves off as a supposed man-made substitute for marijuana. Oakland County has been hit pretty hard lately by the stuff. A recent rash of horrifying deaths are tied to K2 in some way or another. In one case, a teenager stands accused of killing his father and critically injuring his mother and brother; in another, a grandmother is charged with murdering her teenage grandson. She is reported to have said she was afraid of him, and he’d been using K2. Michigan legislators are trying to pass legislation that would allow criminal prosecution for selling the substance, which Hartig said is actually nothing at all like marijuana, even if it’s marketed as a synthetic substitute for weed. The proposed legislation would allow K2 sellers to be prosecuted as if they were selling, or rather, trafficking, marijuana.